Who doesn't enjoy a free brekkie? Especcially when it's organic! Granola 10 mins on gas 4 (180) and turn pop in for another 10 and for the Breakfast Bars - whizz the ingredients in a food processor, press down into a tin and chill in the fridge until they set. For the cordial we used the Woodland Trust's fantastic recipe, but only used 200g of organic raw cane sugar in ours - go to the recipe here. 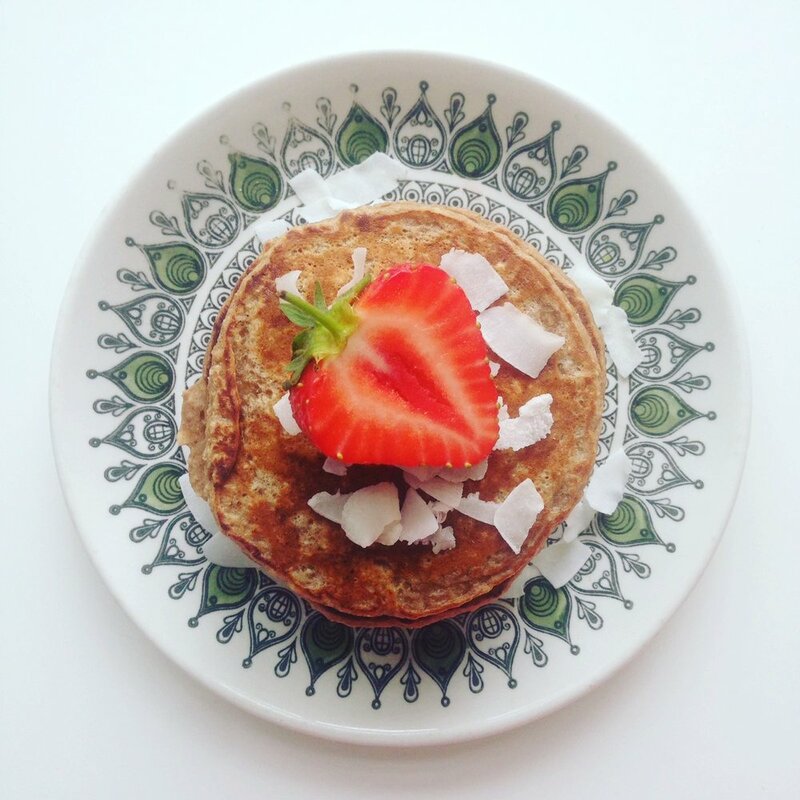 1 cup almond milk, 1 banana, 1 tsp cinnamon, ½ cup oat flour (made from oats), coconut oil for frying. Whisk it all together and fry n flip in the pan! Top with strawberries, CoYo and toasted coconut flakes. YUM. Compote - 350g organic berries - I used raspberries and blueberries. 50g raw cane sugar and some water. Put all in a pan save about 15 blueberries which we add at the end. Bring to a gentle simmer for about 10 minutes. The fruit should fall to bits, into a lovely mush, but if it needs a bit of help then use a potato masher or a whisk. Add as much water as you need, don't worry if you add too much as you can always pass the mixture through a sieve to get rid of excess. Apple Sauce - peel the apples, about 4 will do. De-core then chop into small pieces. Bring to a gentle simmer with some water, 50g raw cane sugar and a pinch of cinnamon. After about 15-18 minutes they should be mashable. Mash into a sauce. Serve on granola with CoYo yoghurt. Loafing Around make vegan, gluten-free, refined sugar-free baked goods. Their brownies are famous in the Northern Quarter and their loaves are hard-to-believe-gluten-free-standard. Sample the goods daily at our shop McCalls Organics in Manchester, or drool over pictures of their work here. Guga's Kitchen are savoury and sweet treat recipes from the mind of a qualified nutritionist and the stomach of someone who loves delicious home-cooked food. Visit their website for inspiration here.